October 15-21, 2018 is being recognized as Workplace Bullying and Harassment Awareness Week in Prince Edward Island. The Workers Compensation Board (WCB) and the Department of Workforce and Advanced Learning will recognize this week to help bring awareness to psychological hazards that may exist in workplaces. A new resource, developed by the WCB, is meant to help kick start the conversation. The publication on Harassment in the Workplace provides information to help employers and workers to learn more about what harassment looks like, and the impact it can have on the workplace. The postcard also showcases what employers and workers can do to help keep their workplaces psychologically healthy and safe. The new resource is available on the wcb at wcb.pe.ca/workplaceharassment. In an effort to provide information and education, there will be several workshops for employers and workers during the week. On October 17, there will be a workshop in Summerside for employers and workers on “Respectful Workplaces” and on October 18, there will be a workshop in Charlottetown for employers on Workplace Bullying and Harassment. Please check the WCB calendar of events at wcb.pe.ca for session dates and locations. For more information and additional resources on bullying and harassment in the workplace, visit the Canadian Centre for Occupational Health and Safety (CCOHS) website at https://www.ccohs.ca/topics/wellness/violence/. 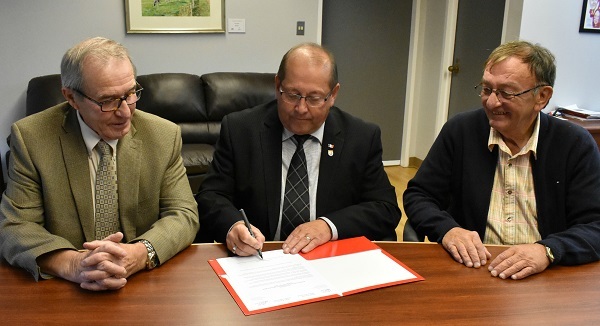 Stuart Affleck (L), Chair of WCB Board of Directors, Sonny Gallant (Centre), Minister of Workforce and Advanced Learning, and Carl Pursey (R) president of PEI Federation of Labour sign the proclamation for Workplace Bullying & Harassment Awareness Week.